When I started collecting cards again a couple years ago, I deeply regretted not having the cards from my childhood. I think that’s a fairly common occurrence amongst collectors. It’s the traditional “cards your Mom threw out” scenario. My father, when I was born, bought a Topps factory set for me to have when I was older. My grandfather collected “stuff”, and my Dad was (and still is) a baseball nut, so cards just sort of made sense to them. Neither one of them collected cards specifically though. My grandfather actually set aside a coin collection as well, something I was never really interested in. I still have it and I found it the other day. It’s mostly silver eagles and liberty silver dollars. Anyway, the Topps factory set lived in the closet for the longest time and eventually made it’s way to my shelf when I was 7 or 8. I had started buying the occasional pack of cards from the corner store (good ol’ Cumberland Farms) but I was keeping them in a shoebox and not really caring about them beyond the fact that Rodger Clemons or Ellis Burks or Wade Boggs were on them. I bought cards up until Upper Deck was introduced and their premium price was just too much for a kid who was busy with other things. So, eventually that shoebox disappeared, along with the factory sets. When I moved away for college, everything was boxed up and put in the attic, childhood memories and teenage randomness a like. Later, after college, and when I moved to Texas, most of that ended up coming with me. A couple years ago, when the collecting bug bit again, I remembered having all those cards when I was a kid. I climbed up into the attic and started going through boxes I hadn’t touched in years. The shoebox was gone, as were most of my cards. I found a tiny wooden box that I stuffed cards in that must have been over looked in a Motherly clean-out. I had a small sampling of what were probably my last cards, a bunch of ’92 Donruss and Upper Deck. I also found a single blue binder that contained a complete set of 1987 Topps. That’s all I had left. Like I said, that’s hardly a unique story. I always told myself that my collection, going forward, wasn’t as much for me, as it was for me and my kids, or their kids, or who knows. Something about all those missing years bothered me though. That was MY childhood, and it was gone. I felt like I missed out on something, and I regretted not collecting, not holding on to those cards, and not having them now. So, it became my secondary mission to replace those missing years, just for me. While everyone else was throwing out 80’s junk wax, I wanted it. I told all this to a friend of mine who likes to haunt local estate sales and auctions and over the past year or two he’s managed to find me some complete sets for basically nothing. I have complete sets of 1984, 1985, my original 1987 set, and 1989. That was all I had up until this weekend. This weekend I found a seller on ebay who was clearing out a whole bunch of stuff. I only bought team sets, since that’s all I really wanted anyway. If I want the important rookies from the 70’s and 80’s who weren’t Red Sox, I’ll pick them up one at a time if I ever feel the need (which I don’t). So, for $0.99 a piece, I picked up 1978, 79, 80, 81, 82, 88, 90, 92 and 1993. I replaced a good chunk of my childhood card memories for less than $10. I don’t know whether that’s sad and pathetic, or completely awesome. I’m leaning towards awesome. It feels good to cross all that off my checklist in one big swoop. I know this post doesn’t have any images, and that’s because the cards as still on their way, but it doesn’t really need to. It’s more about the story anyway. I might scan them when they get here, I might not. I am going to go through them and enjoy the memories though, and that’s just between me and the cardboard. That just goes to show you where my mind is at the moment. I didn’t even notice that my two Tier 1 Silver Ink autos are actually different photos. 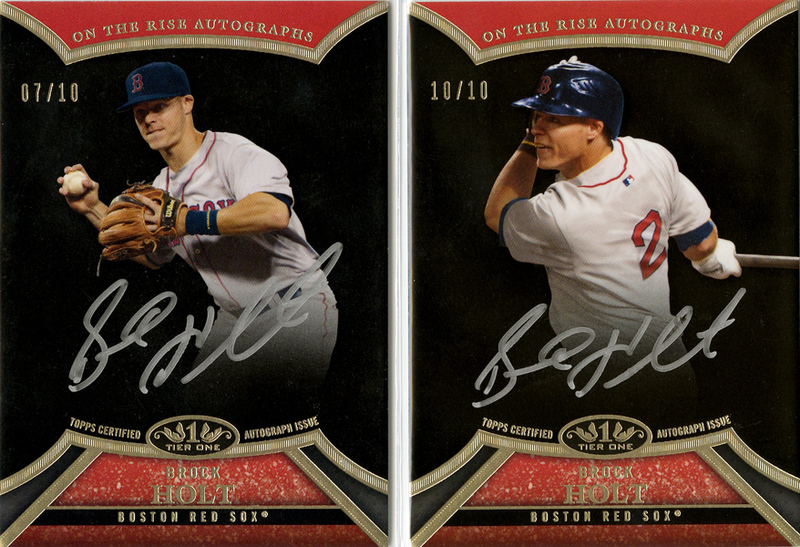 My Brock Holt 7/10 and 10/10 show him fielding and batting (respectively). I kind of like that there are photo variations. It makes it seems like an extra bit of added rarity (5 of each, maybe?). I have no idea if they alternated numbers/photos or if it was random. I did notice that the base autos (/399) had two different photos, but that lower numbers (sub /200) seemed to be one photo and higher numbers seemed to be the other. I completely missed the fact that the silver ink alternated photos as well. So, yeah, that just sorta worked out nicely all by itself. That’s a lie. There’s way more than a couple. We’re trying to teach our daughter the differences between “a few”, “a couple” and “both”, which admittedly, are hard concepts for a 2 year old to grasp, but it’s just funny to see her count out 7 Skittles and then ask if she can have “both” of them. So, here’s just “a couple” cards, all 35 of them. Time to catch up on some want lists. These are mostly for me and my organizational skills (or lack thereof), but if you happen to have any of these, I’d love to talk to you about a trade.